Our leather ‘colonial’ credit card wallet design was given to me from my teacher at the Conner Prairie, Ind, leather bag making class in which I took part . Our leather ‘colonial’ credit card wallets are made with goat skin or vegetable tanned cow hide and antiqued. Our leather ‘colonial’ credit card wallets are different colors due to the different types of leather we use and the antiquing process. Our leather ‘colonial’credit card wallets are hand stitched with flax thread. Our leather ‘colonial’ credit card wallets have a wrap around leather closure. Our leather ‘colonial’ credit card wallets are authentic to use in Colonial Period Reenacting. Our leather ‘colonial’ credit card wallets are $10.00 each plus sales tax and shipping. 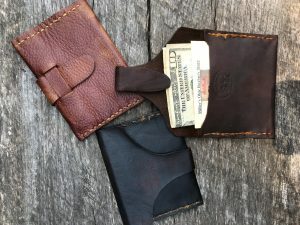 These leather money wallets were designed from my great grandfathers 1893 pig skin leather wallet. Our leather money wallets are made from pigskin, goat skin or vegetable tanned cow hide. Our leather money wallets are all leather and hand stitched with flax thread. Our leather money wallets are antiqued. Our leather money wallets are different colors due to the different types of leather and the antiquing. Our leather money wallets have a wrap around leather closure. A long pocket holds the paper money securely. Some of our leather money wallets have the option of an extra money divider. Our leather money wallets also has a coin pocket and an extra pocket for credit cards, receipts, or business cards. You have a choice of a straight cut edge or a natural leather edge along the paper money pocket. Our Leather Money Wallets are authentic to use in every day life or in Colonial Reenacting. The money is not included. Our leather money wallets are $25.00 plus sales tax and shipping. As our items are hand made there may be a waiting time to complete your item. These money wallets I designed per a customer’s request. 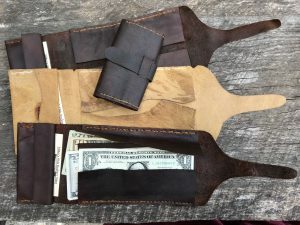 These leather money wallets have one long money pocket. 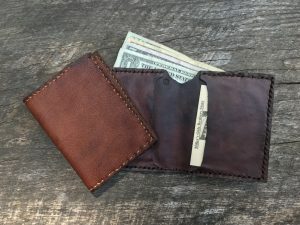 These leather money wallets have two side pockets for credit cards, receipts, or business cards. I hand melt the beeswax for these cute little + 2 1/4 inch beehive candles. These beeswax beehive candles are quit a conversation piece, stocking stuffer, and gift. 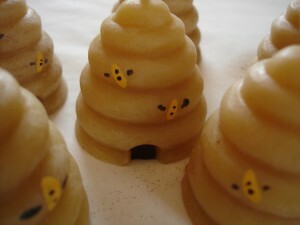 The hand painted bees on these beeswax beehive candles look like they are ready to fly home. $3.00 each plus sales tax and shipping. The large, primitive, pineapple shaped, pure, solid, beeswax, candle is the True sign of Hospitality! The large primitive pineapple comes grunged with cinnamon. The story of the Early American Hospitality, a beeswax tea light, and burning instructions is included with your purchase of the large primitive pineapple candle. 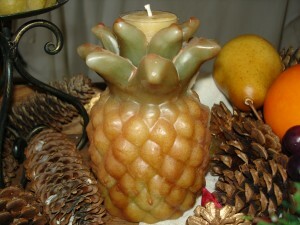 The Large Primitive Pineapple Candle is $21.95 plus sales tax and shipping. 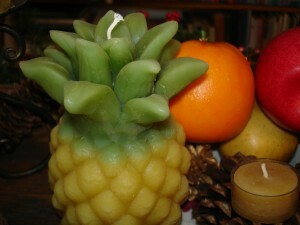 Our large colonial pineapple shaped pure solid beeswax candle is the true sign hospitality! Our large colonial pineapple comes with the story of the Early American Hospitality, a beeswax tea light, and burning instructions. Our large colonial pineapples are $19.99 plus sales tax and shipping. 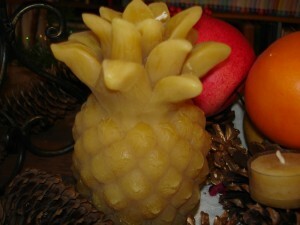 Our large pineapple shaped pure solid beeswax candle is the sign of True Hospitality! Our large pineapple shaped pure solid beeswax candle comes with the story of the Early American Hospitality, a beeswax tea light, and burning instructions. 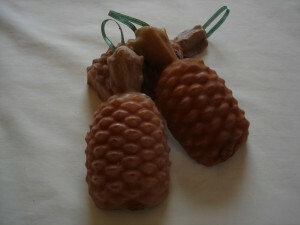 These mini pineapple shaped pure beeswax hangers show a real sign of early American hospitality. Our Pineapple shaped Beeswax Wall Hangers come with a Story of Hospitality. Our Pineapple shaped Beeswax Wall Hangers can be given as a gift, hung by themselves, or added to another arrangement for color and class. 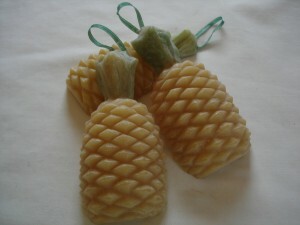 Our Pineapple shaped Beeswax Wall Hangers are $ 3.99 each plus sales tax and shipping. Our Pineapple shaped Beeswax Wall Hangers are also available grunged with cinnamon to add a primitive flare. 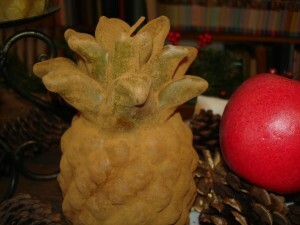 Our Grunged Pineapple shaped Beeswax Wall Hangers are $4.99 each plus sales tax and shipping. 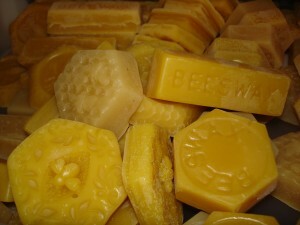 These pure beeswax minis of assorted styles are ideal for your hunting pouch, nail bag, or your sewing basket, or any small project where you may need just a bit of pure beeswax. As our items are handmade there may be a waiting time until we get you item/items completed. 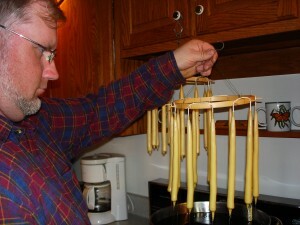 As you can see our pure beeswax hand-dipped taper candles are really hand-dipped! We now have three sizes of the hand-dipped tapered beeswax candles. The sizes of our hand-dipped beeswax candles are 4″, 6″ and 12″. 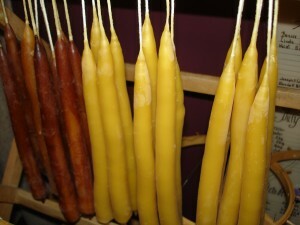 We also grunge some of the pure beeswax hand-dipped tapered candles with cinnamon to add an primitive flare! We try to keep the hand-dipped pure beeswax taper candles on hand but please call us to see the availability of the current sizes of our hand-dipped pure beeswax tapered candles you are interested in purchasing. 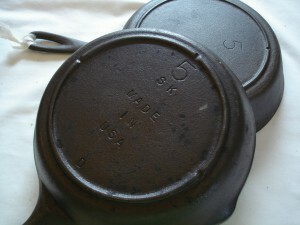 We have assorted Cast Iron Skillets for sale. All of our cast iron skillets have been cleaned and seasoned. All of our cast iron skillets are ready to use. 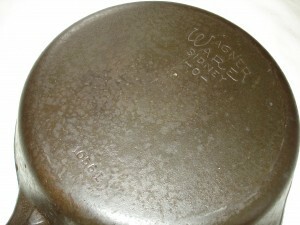 Contact us for the availability of the kinds (whether they are Wagner, Griswold, USA Made, etc) and sizes of the cast iron skillets that we have on hand.